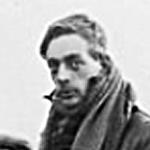 Lord de Clifford was a motoring enthusiast who mostly raced Lagondas. He competed in rallies and sports car events including the Le Mans 24 Hour race. Lord de Clifford was a motoring enthusiast who first competed with a Lagonda in 1929 winning a Gold Medal in the London to Exeter Trial. In 1931 he took on the Monte Carlo Rally, bringing his supercharged 2-litre Lagonda 'Low Chassis', reputedly capable of 90 mph, to fourth in class and 20th overall. The following year he tackled the event in one of the large Selector 3-litre Tourers. The Lagonda M45 was introduced in 1933 and Fredie took the prototype to Greece, beating the train to Brindisi by 14 hours. For 1934, de Clifford entered the M45 prototype in the R.A.C. Rally and in March, he took delivery of an early Rapier chassis to built up into a special suitable for for Le Mans. Using a short-throw crankshaft, the capacity was reduced to under the 1100 cc class limit and a higher compression ratio was used. A larger 18 gallon fuel tank was fitted along with a special two-seater lightweight racing body by E.J. Newns of Thames Ditton. Registered as BMG 2, the car tested at Brooklands at 90 mph before the car was transported to France for the race. Driving with Charles Brackenbury, the Lagonda was outclassed, however they did manage to bring it home in 16th place, thus qualifying for the Rudge-Whitworth Cup, despite running on three cyclinders for the last three hours. de Clifford also drove an Alfa Romeo 8C 2300 at Le Mans that year with Owen Saunders-Davies, but failed to finish. Following the race Dobson and de Clifford Ltd was established across the bridge from the main factory in Stains. They offered three states of tune for Lagonda Rapier owners, normal, sporting and full race. These cars were marketed as De Clifford Specials. But the following year, under the management of Alan Good, the Rapier was discontinued and with it the De Clifford Specials. In 1937 he raced Singer Nine Le Mans Replica at Le Mans with Mrs Marjorie Eccles but they failed to finish and in 1938 he drove a Talbot (Darracq) there with TASO (Thomas Alastair Sutherland Ogilvie) Mathieson, once again failing to finish.